Almost immediately after beginning my adventures in genealogy, I regretted not having done this research while my grandmother was alive. For one, her side of the family is particularly interesting. Her father, Richard Morgan Player, emigrated to Canada at the end of the 19th century and there are plenty of records in both England and Canada from his life. But more importantly, I wish I had done this while she was alive because I managed to find her relations in England. It turns out that our cousin Simon, a descendant of RM Player’s brother Joseph William , has been working hard at collecting family materials as well. Most of the exciting information that I have about the Coventry Players comes from Simon and I am grateful that I was able to find him. RM’s father Joseph Player owned a watch-making factory in Coventry, England. The family and all of their ancestors were well-established middle class citizens, could perhaps even be called upper class industrialists. 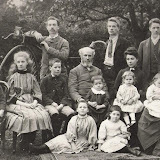 I remember my grandmother telling me that my g-grandfather had taken my g-grandmother Jessie on a trip to meet the Coventry family and she had complained that they had treated her like a second class citizen. I have to say, however, that this was hardly fair to Jessie as she was the daughter of one of Ontario’s big fish: RE Truax (I’ll get to him at some point). Samuel Newsome. Born in Dec 1869 in Coventry, Warwickshire, England. Samuel Newsome died in 1941; he was 71. Eliza Lomax. Born abt 1872 in Coventry. Eliza Lomax died in Meriden, Warwickshire, England, in Mar 1900; she was 28. Percy Morgan. Born abt 1874 in Coventry. Percy Morgan died in Coventry abt 1884; he was 10. Frances Gertrude. Born abt 1876 in Coventry. Frances Gertrude died in 1955; she was 79. Alfred Septimus. Born in Mar 1879 in Coventry, England. Alfred Septimus died in South Africa, on 25 Mar 1902; he was 23. Agnes Elizabeth. Born abt 1881 in Allesley, Warwickshire, England. Agnes Elizabeth died abt 1950; she was 69. May Jessie Byard. Born abt 1883 in Allesley, Warwickshire, England. May Jessie Byard died in 1950; she was 67. Miriam Janet. Born abt 1885 in Allesley, Warwickshire, England. Miriam Janet died in 1938; she was 53. Simon and I were surprised to discover that we both had the beautiful family portrait which appears above in the photo album. We have taken to calling it the “penny farthing” photo. When we discovered another more distant Player cousin in Ottawa, we were again surprised to learn that his aunt had been sent a copy of the photo from Simon’s grandmother several years ago. It is easy to understand why this photo has not been lost over the ages. My grandmother had it hanging above her bed for years. Joseph and Eliza Player also had the helpful habit of naming their children with family names. Almost all of the children have middle names of closely related families. For those of you who are descendants of (Lo)max and Bernice, you may be interested to know that the name Lomax comes from RM’s great aunt, Elizabeth Newsome Lomax. She married a Mr. Lomax, who must have died young as she lived with her brother Samuel Newsome for many years. RM’s sister Lilla’s proper name was Eliza Lomax Player and she died young in 1900. It was possibly for this reason that RM decided to name his son Lomax. The penny farthing photo led to another discovery. At one point, my aunt wrote to me and told me that she had one of the chairs from the penny farthing photos. I mentioned this to Simon and he was able to tell me that his grandfather had the other seven from the set. My aunt took her chair to the Antiques Roadshow and the interviewer became quite excited to hear that the chair had belonged to a Richard “Morgan” as there was a furniture company in England circa 1820 called Morgan and Sanders. While it is very clear that we are related to a Morgan family (Joseph Player’s mother was Elizabeth Morgan), it is not at all clear that there is relationship between this Morgan family and Morgan and Sanders. This one will take more work to figure out. About a year ago, when my grandmother died, I started to look some genealogical information on the internet in order to put together a photo/family album of my grandmother’s life. One google search later and I had at least five sites that referred to my great-great-great-grandfather. Yikes! The internet had radically changed genealogy since my last abortive attempts to put together our family history at the age of twelve. Suddenly, the hunt involved clever google searches, insanely rich online archives and the distinctly real possibility of discovering more about my family’s past than is probably healthy. I was hooked and a year later I have amassed some pretty cool stories, photos and information. With this blog, I would like to share all of my research with anyone who cares. Ultimately, I will put together hard cover copies of my research into the important families in my life, however, right now, I would like to share the progress of my research and get feedback on what I am collecting. Here’s a couple of disclaimers. As I have learned, it is incredibly easy to make mistakes in genealogy research, so beware. There are mistakes living here! However, bring them to my attention and I will do my best to correct them. Feel free to copy and pass on anything that you find here, but share alike and let me know if you have information that might be of interest to me. There is a non-commercial creative-commons licence for this site which means that you can’t use any of my research to make money. I have done my best to ensure that the privacy of the living members of my family is maintained. You can contact me at twigg3d@gmail.com if you have any questions about my research. I look forward to hearing from you!